Welding, Manganese Fumes, and Related Negative Health Effects - Sentry Air Systems, Inc.
Manganese, a naturally-occurring element, is a very important component for a variety of manufacturing and industrial operations, especially iron and steel production. It is also considered to be an essential nutrient for humans. It assists in a variety of bodily processes, including antioxidant function, metabolism, bone development, and wound healing . It can be found in “pecans, peanuts, pineapple fruit and juice, oatmeal, shredded wheat, and raisin bran cereal. Good sources are beans (pinto, lima, navy), rice, spinach, sweet potato, and whole wheat bread” according to www.nutrimirror.com. In a healthy individual with proper immune and organ function, normal amounts of ingested Manganese can be digested and disposed of with ease. [Visit the Food and Nutrition Board (FNB) of the Institute of Medicine website to search for Adequate Intake Amounts of Manganese]. Short-term exposure may lead to metal fume fever, which symptoms include fever, chills, nausea, fatigue, muscle ache, joint pain, and thirst, among others. These symptoms usually resolve themselves within 24-48; however, long-term and chronic exposure to manganese fumes can lead to a disease called Manganism which has symptoms similar to those related to Parkinsons. Workers can be exposed to Manganese fumes during a variety of welding operations; it is difficult to be specific because of differences in and multiple combinations of welding wire, fluxes, and base metals. 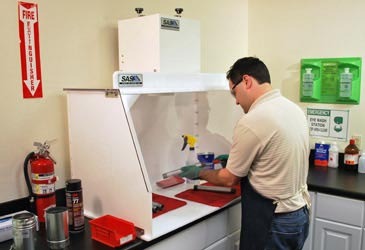 Respirators and local exhaust ventilation, also known as fume extractors, (example shown below) are typically the recommended engineering controls for welding fume control; however, a Certified Industrial Hygienist should be consulted in order to determine the best safety approach based on the amount of fumes produced, materials involved, and environmental considerations. [See “Exposure Sources and Control Methods” on OSHA’s webpage dedicated to Occupational Safety and Health Guideline for Welding Fumes for further information]. For additional information on Local Exhaust Ventilation for Welding Fume Control, give Sentry Air a call at 1.800.799.4609, email us at sales@sentryair.com, or fill out this form to receive more information. *** This blog entry was written as a customer service and no representation is made as to the completeness or accuracy of the information it contains. Persons that believe they have been overexposed to manganese fumes should consult a healthcare physician or seek medical assistance. If you believe you are being exposed to these fumes in your workplace, consult a industrial safety officer or management team regarding this issue.